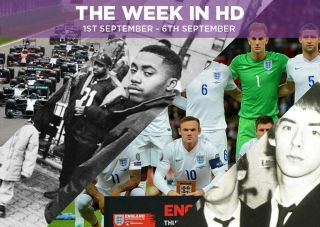 The Week in HD - Pride, the Italian Grand Prix, Euro 2016 qualifying, Hannibal and more | What Hi-Fi? A Change is Gonna Come. Detective Hodiak is on edge after going through personal and professional problems, so now really isn't the best time to have a one-to-one with cult leader Charles Manson. Stephen Merchant's comedy series about a hapless unlucky-in-love Englishman living in Los Angeles ends with a feature-length special. When he finds out that his ex-girlfriend and her new husband are heading to LA, Stuart attempts to save face by hiring a model to pose as his new beau to show he's winning at life. Alternative Ingredients. Baking without sugar, gluten or dairy? Sacrilege. But this week, the contestants are required to make sugar-free cakes, gluten-free pittas and a dairy-free ice cream roll in what must be GBBO's most difficult challenge yet. The Wrath of the Lamb. Hannibal comes to a bloody end as Will, Hannibal and Dolarhyde face off against each other in the series finale. Who will be the last one standing? Tip: stick around until the very end of the credits for a special surprise. This eight-episode series explores some of the strangest events to have happened on planet Earth. It includes a bird-killing solar death ray. And a monkey that can do first aid. Pilot/Flotsam and Jetsam. Fantastic BBC Three original series about a vampire, a werewolf and a ghost sharing a house in Bristol. If you've missed it when it was originally airing, now's your time to catch up. Watch Mitchell, George and Annie dealing with normal household issues alongside their own conditions, all the while making sure the outside world doesn't find out the truth about them. Amazon's TV slate for the autumn begins with the interesting-looking Hand of God. It stars Ron Perlman as Judge Pernell Harris, a law-abiding man who suffers a mental breakdown, believing visions of his hospital-bound son are sent by God. These visions compel him to locate the man who tore his family apart and enforce some vigilante justice. It sounds and looks bonkers, so naturally we'll be watching this series as it unfolds. This documentary digs into the life of rap singer Nas, looking at his humble beginnings living in the Queensbridge Houses in New York to his emergence as a new, authentic hip hop star with 1994's Illmatic. It perhaps doesn't pack in as much detail as you'd like, especially about Illmatic, but it does offer an illuminating look at an artist who breathed new life into the hip hop genre. It's Pixar season on Amazon Prime, with Up the first of many films from the animation giant to be on the streaming service. The film, arguably the last great one from Pixar, is a tale of an elderly widower who sets off on a voyage to South America in a balloon-covered house. He gets unwanted company when a boy scout stows away, and reluctantly makes friends with him. It's a great film, both sad and fun, with Doug the dog one of the best sidekicks Pixar has created. Richard Hammond, Sean Lock, Judy Murray and Trevor Noah join Lee Mack and David Mitchell in this panel game about trying to pass off truths as lies, and vice versa. England kick off against San Marino with qualification for Euro 2016 in sight. Wayne Rooney is close to becoming England's all-time record goalscorer, but aside from a hat-trick for Manchester United in Europe, his form has looked decidedly iffy so far this season. With goals aplenty expected against the European minnows, surely he'll break Sir Bobby Charlton's record this week? Set during the miners' strike of 1984, a group of gay activisits form an alliance with the Welsh mining community to make history. Wonderful comedy drama, starring Bill Nighy, Dominic West, Andrew Scott, Paddy Considine and more. Packed with archive performances and interviews with Paul Weller, Bruce Foxton and Rick Buckler, this documentary sets out to tell the definitive story of mod-rockers The Jam. And if you want more, don't miss out on Somerset House's excellent exhibition The Jam: About the Young Idea, which tracks the band's history, music and influence through unseen material, fan memorabilia and more. Monza. The championship is beginning to look like a procession, with Lewis Hamilton bagging another easy win in the last round in Belgium. Nico Rosberg will need to up his game after a number of disappointing performances. We'd expect the Ferraris of Vettel and Raikkonen to give the Silver Arrows some sort of contest in front of the team's home fans. Perhaps a Prancing Horse win could add some spice to a race that may not be on the F1 calendar for much longer, despite the circuit's rich history.